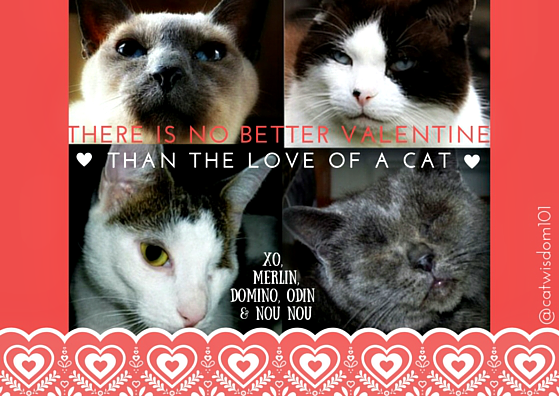 Are you wondering what the best Valentine is for cat lovers? This year Valentine’s Day spending is expected to reach a blush-worthy 19 billion in the U.S. and over 700 million will be spent on pets. My hubby and I must be very unromantic since there won’t be champagne, roses, chocolates, lingerie, perfume, romantic dinners at our house but we did spend a small fortune on vet bills and the dentist! Gifts are nice but the loveliest Valentine is the love of a cat. At least that’s what my cats say. Cats are very particular who they love and there isn’t enough caviar in the world to bribe or force their feelings. When they CHOOSE to love you, it’s true LOVE. 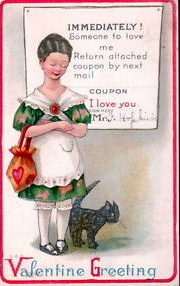 If you love vintage cat Valentines, check out more of our Valentine post scanning 120 years of kitty V’ Day love! Wait, there’s more. I’ve saved the best for last to prove a purrfect point. Happy Valentine’s Day to you, dear friends. Love you! Happy Valentines Day to you, Merlin, Domino, Odin and Nou Nou. Happy Valentine’s Day purrs to you Miss Cynthia. MOL! We’re gonna give the mom and dad-guy lots of love for Valentine’s Day. It’s the best gift…and it doesn’t cost a thing. Happy Valentine’s Day. Cats are the best valentines. Happy Valentine’s Day. Great weather for cuddling with loved ones, two and especially four legged ones. 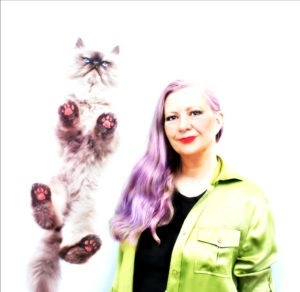 Thank you for the film clip…the best part was of course the kitties! The love from an elusive, mystical, magical creature like a cat is indeed PRICELESS!!!! We consider ourselves truly blessed! Luvs to the gang! Luv the Valentine card with all 4 of you! Skeeter and Izzy & the Feral Gang + Twig & Peanut & Romeo & the Angels >^..^^..^<~ Whole Lotta Luvs at our house!!! My Mom and Dad did go out to dinner but on Thursday before the big rush at all the restaurants! Dad got Mom a BIG BOUQUET of flowers too…..but tomorrow, on Valentine’s Day – we three will spend the whole day together……and that’s the best way to spend the day – TOGETHER. Happy Valentine’s Day to you and your WHOLE family Miss Layla! Smart to go out early. V day is crowded, overpriced and generic but I did have a few nice ones a million years ago. Couldn’t agree with you more! No gifts here either (at least non from me! lol)….no dinero!!!! We do the card thing (but this year mine will be electronic)…….when I was young Valentine’s Day meant the world to me, no more! Aww, nothing better than Fabio, kitties, champagne and a romantic movie channel. As for romantic movies, they rather like them, because I sit quietly and pet them for hours. Unless I’m crying. I wondered how many younger reader even remember Fabio from way back but happy to see him get a reboot. Oh Easy you are aromantic dog! We dont do gifts for the kitties either, its Valentines Day every day! I agree, if a cat loves you, they love you. Some are more social and will allow others to touch and pet them, but you can tell if you are their human.